The recent (and sudden) heat wave here in the Midwest means that spring is here and America’s pastime is ramping up for its 2012 debut. 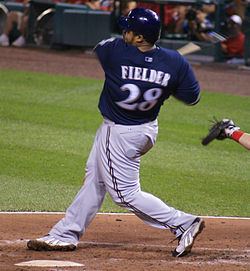 Brewers fans going to miss watching Fielder turn those massive hips on opposing fastballs and sending another moonshot to downtown Milwaukee. This past offseason saw the movement of one of the Greatest of All Time (GOAT), Albert Pujols, another potential GOAT, Prince Fielder, (if he can lay off the Tofu bacon cheeseburgers), and multiple other big names like C.J. Wilson and Jose Reyes. The Crew had a wild offseason. Right off the bat (to be punny), they had to come to grips with the notion that Prince was not coming back. A guy who averaged 40+ bombs, 110 RBIs, and 90+ Rs, for the past six years was packing up his vegetarian patty press and skipping town. He leaves behind him a pretty significant void. Both literally and figuratively. Not only will Prince’s numbers sorely be missed, but, the protection he provided in the line-up, the insurance for Mr. Bernie Brewer, Ryan Braun, is what Brewer fans (and Braun) will miss the most. Considering Braun’s off-season, if he was not a principal owner of FedEx stock before this season, he certainly is now, losing his battery mate could make life a lot more difficult. Without Fielder’s presence in the line-up, pitchers can go after Braun a little bit more aggressively. This is particularly nasty for a guy who hits most MLB fastballs like he is hitting them off a tee. Add to that the cloud of uncertainty overshadowing Braun’s every move, that void will likely be amplified. To help fill that void, the Crew went out and signed All-Star 3B, Aramis Ramirez, to a 3 year, $36 million deal. It is the kind of deal that actually balances the risk (Ramirez is an enigma — to say the least) and the reward (he is an undeniable talent). If the talented/semi-driven Ramirez shows up, he will be serviceable protection for FedEx’s No.1 Fan and will help drive a better than average MLB offense. Gamel has some mighty big shoes to fill, but, if this year's spring training is any indication, he just might be up to the task. 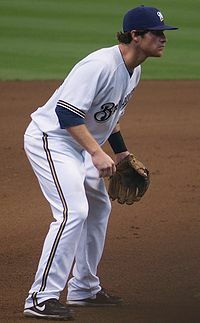 The other question marks for the Crew are perpetual prospect-in-waiting, Mat Gamel, and consummate professional, Corey Hart. Gamel has had a terrific spring-training (.400 AVG and 4 HRs), and he seems to be relishing the opportunity to fill-in Fielder’s shoes at 1B. If he can finally perform at he level scouts have long-projected him at, Fielder’s departure will not hurt nearly as bad. Hart has been a mainstay in the Crew line-up for the past 8 seasons. He is a versatile player, he can leadoff or hit 5th, who does a little bit of everything for the team. He underwent off-season knee surgery and has yet to play an inning of baseball this spring. His successful return from that surgery is going to be integral to the team’s success overall. From a pitching perspective, the Crew did not make any significant moves in the off-season. They will rely, for the most part, on the same stable of arms that they had last year. That stable is headlined by Zach Greinke (pitching in a contract year), Yovani Gallardo, and Shawn Marcum. When healthy, and that is the critical distinction, these three starters are probably as good, or better, than any other 3 starters in the NL. Only the Phillies can run out a set of 1-3 starters that can match up with the Crew. But, health is the wild card with all three guys. Marcum is already on the shelf with shoulder issues. Both Gallardo and Greinke have had their own injury issues in the past. If those three guys can remain relatively healthy, they will keep the Crew in most games. The bullpen is still anchored by All-Stars John Axford and K-Rod. Both men were steady performers in the late innings for the Crew. If the starters can get the Crew to the late innings, these horses will take it from there. Ultimately, the Crew’s success this season is going to hinge on the squad’s ability to ignore the outside distraction (Braun’s FedEx miracle, Fielder’s absence, K-Rod’s age, Gamel’s boom-or-bust label, etc.) and focus on the business of playing baseball. If they can limit the outside distractions, this team can make a push to win the NL Central crown. And, if they can find their way into the playoffs, they have the staff to match-up with anyone in the National League. Prediction: 91 wins. NL Wild Card. This entry was posted in Home, Twins v. Brewers and tagged Albert Pujols, Aramis Ramirez, C.J. Wilson, Corey Hart, Cory Hart, FedEx, John Axford, Jose Reyes, K-Rod, Mat Gamel, Milwaukee Brewers, Minnesota Twins, National League, NL Central, Prince Fielder, Ryan Braun, Shawn Marcum, The Crew, Yovani Gallardo, Zach Greinke. Bookmark the permalink.